Thomas Dunne Books, 9781250113948, 352pp. Born and bred a nerd, he spent his early years between Detroit, a city so nerdy that the word was coined there in 1951, and, improbably, Geneva, Switzerland. His adolescence and early adulthood was spent primarily between the covers of a book and indulging his nerdy obsessions. It was only when he found his true calling, as an actor and unintentional nerd icon, that he found true happiness. With whip-smart, self-effacing humor, Armstrong takes us on a most unlikely journey—one nerd’s hilarious, often touching rise to the middle. He started his life as an outcast and matured into…well, an older, slightly paunchier, hopefully wiser outcast. 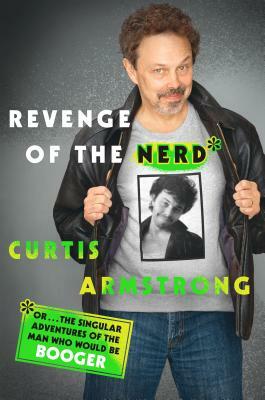 CURTIS ARMSTRONG was born in Michigan in 1953. He divided his early years between Detroit—a town apparently so nerdy that the word “nerd” was coined there in 1949—and Geneva, Switzerland, which by comparison, wasn’t nerdy at all. Following a childhood spent mainly between the covers of books, Armstrong discovered the theatre. He studied at the Academy of Dramatic Arts in Rochester, Michigan, which led to a forty-plus year acting career that shows no signs of slowing. After eight years of stage work in New York and around the country, Armstrong was cast in his first film, Risky Business, starring Tom Cruise. It was the beginning of a string of classic comedy films and television shows, including Better Off Dead, One Crazy Summer, TV’s Moonlighting and, most significantly, Revenge of the Nerds, in which he played the iconic role of Booger. Since then Armstrong, a nerd icon himself has appeared in dozens of films and TV shows including, recently, Supernatural and New Girl. He co-created and co-hosted the hit comedy-reality show King of the Nerds, which brought his nerd narrative full circle. He is married to writer Elaine Aronson, and has one daughter, Lily.